Teen Ink is an independent publication of The Young Authors Foundation which feels that a great need of young people (tweens and teens alike) is to “preserve the sense of self-worth”. They hope that through their magazine (similar in design to that of a forum) helps youth express themselves, their needs, aspirations, and pleasures through their submissions in the categories of poetry, essays (college entrance essays, opinion point of views), stories (fiction and nonfiction), reviews (books, movies, TV shows, music, video games), art and photography. Highlighted Teen Ink submissions include memorable essays and stories such as Green Can Mondays, a nonfiction personal experience in which a girl discusses the oddities, adaptation, and successes of her father suffering from OCD (May 2012), or the view of war and the side effects it has on children in The Sins They Die For (October 2005), one teen’s point of view regarding texting and the effect it may have on the English language in Texting: The Gr8 Deb8 (May 2012), and even the discussion of what art is and its purpose in Can Video Games Be Art? (February 2010). Interesting poems include The Social Network: The Modern Monster (June 2012) addressing the detriment of reduced human interaction, the health related poem titled Asthma: the Price of Life (February 2012) that creatively describes the process of using an inhaler, and a shocking dissapointmnet in First Kiss (October 2005). Art and photography samples include a freehand pen & ink sketch done while on a vacation in New York titled I Am the Hot Dog Man (February 2012), an endearing picture of a daughter and mother in the photograph Ferris Wheel Kiss (May 2012), or the photo following a natural disaster titled A Nightmare on Sesame St. (April 2012). Book reviews that are considered middle-grade readers (for tweens) include The Amulet of Samarkand by Jonathan Stroud (April 2012) and Stormbreaker by Anthony Horowitz (April 2012) is compared to James Bond, and even the manga XxxHolic by CLAMP (November 2012). Other reviews such as music and how youth find them uplifting or inspirational include the entries Teenage Dream by Katy Perry (April 2012) and Simple Plan which highlights a popular punk band (May 2011). TV shows reviewed include a wide array from The Secret Life of the American Teenager (January 2010) to Terminator: The Sarah Connor Chronicles (May 2009). Movie reviews includes Abraham Lincoln: Vampire Hunter (October 2012) which is highly entertaining to read, Snow White and the Huntsman (September 2012) that is praised due to being more accurate to the Grimm version as well as Snow White being a strong female role unlike the Walt Disney version, and The Chronicles of Narnia: Prince Caspian (September 2008) interestingly suggests the themes of immigration as seen in the United State and the search for a better life. Teen Ink is acknowledged by many professional adults (athletes, educators, artists, authors, community leaders, etc.) who subscribe to the magazine because they believe in the importance of the youth and their voices being heard. These even include celebrities such as Steve Martin, Caroline Kennedy, Alicia Keys, Laura Bush, Carl Lewis, Ice Cube, Margaret Spellings, Chris Crutcher, Ira Glass, George Lucas, Sen. John Glenn, Martin Sheen, Michael Crichton, Tony Hawk, Tom Fontana, Andrew Shue, Hillary Rodham Clinton, Gen. Colin Powell, Nancy Kerrigan, R.L. Stine, Pedro Martinez, Steven Spielberg, Rev. Jesse Jackson, Whoopi Goldberg, Yo-Yo-Ma, Stephen King, Lois Lowry, Judy Blume, Dr. Maya Angelou, Pat Schroeder, Dan Rather, and Chevy Chase. Teen Ink offers a collection of nonfiction stories, poems, media reviews, photos entirely written by teenage writers arranged issues categorized as “college”, “love”, “sports”, “creative writing”, “parents”, “culture”, “work”, “community service”, etc. It is a monthly magazine devoted to the writings and artwork of teens. Teen Ink has no assigned writers and relies entirely on submissions form teenagers nationwide. Teen Ink offers a place that teens and even tweens find emotional connections with others experiencing similar circumstances or discover new interests through specific topics, particularly reviews. 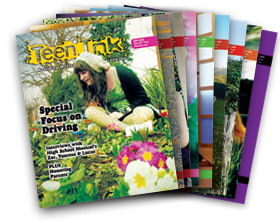 Teen Ink can be found in classrooms, libraries, or one can purchase an annual subscription for the 48-page monthly magazine for $35.